Winter is definitely the time for soups and stews, the richer the better. But around February or March I start to want a break from creamy soups or thick velvety vegetable purees and I start craving livelier flavours (and more veggies!). 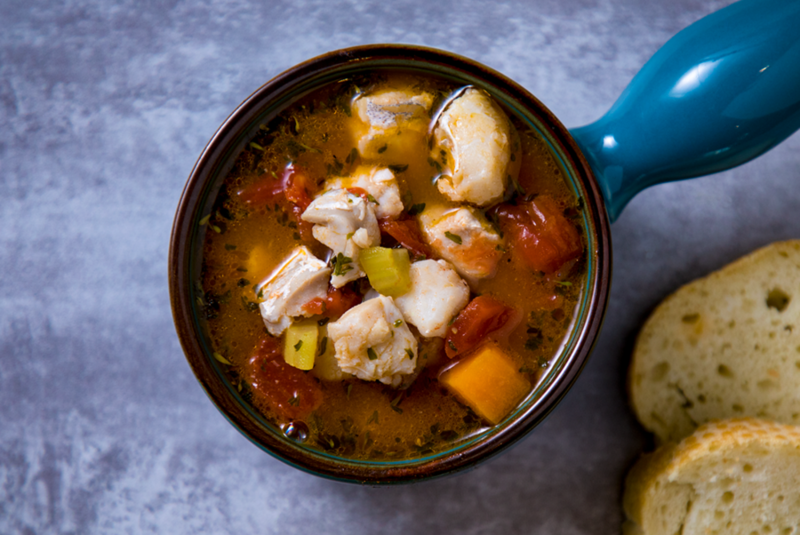 This is where I find something like the Manhattan style clam chowder fits in perfectly – this chowder uses a fish stock and tomato base with hearty vegetables as opposed to the cream base of the more familiar New England Clam Chowder – the combination makes a winter worthy meal with enough hints of summer to pull me through the February blahs or the March madness (that’s me crawling the walls… not the basketball tournament). To be frank, I’ve never had an authoritative answer as to why it is called a “Manhattan” clam chowder. The urban legend that I have heard is that this style of chowder was first invented by Portuguese immigrants to the New England area when they adapted the local cream based clam chowder to reflect their traditional cooking. The story goes that when people in New England saw this chowder they were bewildered why anyone in their right mind would use tomatoes – the only ones that could be crazy enough were those lunatics that lived in Manhattan (regional rivalries are nothing new) – and so the name was born. So that’s were I turn to warm my belly and brighten my spirits at this some bleak time of year (well that and a nice glass of wine) – though I usually end up eating the whole pot myself, because any time I mention eating clams to my kids they screw up their faces and go “eeewww” – but its one meal I’m happy not to share. Render bacon over medium low heat with veg oil until lightly browned. Add onion, celery, carrot, thyme and sweat until onion is translucent. Make a slurry using white wine and potato starch. Add fish and cook for another 8-10 minutes. Season to taste and enjoy!